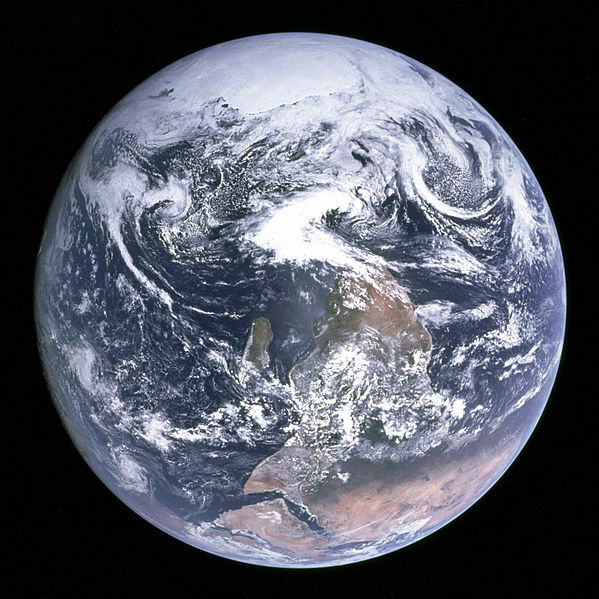 The Blue Marble is one of the most iconic images of the Earth that we have. The colour photograph was taken in December 1972 by the crew of the Apollo 17 spacecraft when they were a distance of about 45,000 kilometres above the surface of the Earth. There are a number of striking features of this image. Perhaps the most obvious is the vibrant colour of the image; the blue, white and browns of the sea, cloud and land. Almost equally remarkable is the very marked curvature of the Earths surface, here is compelling photographic evidence that the Earth is not flat. The last feature that causes us to look twice is the fact that in the original image released by NASA the Earth is “upside down” (at least according to Wikipedia). However, no matter which way up we prefer it and how beautiful we find this picture, as Rene Magritte would have put it; ceci n’est pas une planète. This is not a planet. It is an image of a planet. More precisely this image is a projection of a three dimensional, almost spherical globe, onto a two-dimensional plane. Map makers call this type of projection an orthographic projection. This projection introduces subtle distortions and a gross problem, in an orthographic projection at any one time we cannot see the far side of the object. It was to try and solve this problem that the so-called Mercator projection was developed - which is a trick for showing a spherical Earth on a flat surface. This projection was developed by the 16th Century cartographer Gerardus Mercator in 1569. It was Mercator’s brilliance that allowed him to describe and use a rational method for squeezing the full and irreducible 3 dimensions of the Earths surface into a 2 dimensional piece of paper. There are dozens of different map projections and each and every one of them has issues - HERE is a good overview and introduction.